§3. Definitions. (a) Definition of Certain Foods as Dietary Supplements. Section 201 (21 U.S.C. 321) is amended by adding at the end the following: (ff) The term "dietary supplement" - (1) means a product ...intended to supplement the diet that bears or contains one or more of the following dietary ingredients: (A) a vitamin; (B) a mineral; (C) an herb or other botanical; (D) an amino acid; (E) a dietary substance... or (F) a concentrate, metabolite, constituent, extract, or combination of [same]. As food, dietary supplements are manufactured under cGMPs patterned after food cGMPs and are sold with labeling that provides information about their nutrient content. Under these circumstances, it is my professional opinion, to a reasonable degree of certainty, upon which you may rely, that individuals may choose to achieve and maintain a healthy status through the use of food substances, including dietary supplements. Every person has the fundamental human right to choose what means that person will use for that purpose. As a Conservative Activist in the 1960s I worked with the organization formerly known as Young Americans for Freedom and was a College Young Republican Delegate. I was a Youth for Goldwater. In the first election when I could vote, 1968, I voted for Richard Nixon (he was the peace candidate). I haven't voted for a tax-eater party candidate for President since. I left the (G)OP in '69 when the libertarians were purged from YAF. That led to the founding of the Libertarian Party which has remained the strongest and largest Third Party for the past 40 years. 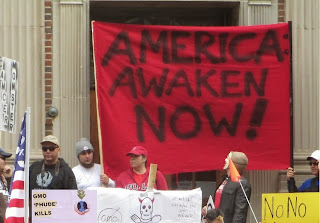 I was there for the first TEA Party action, in '73 when we crashed the Boston Tea Party Bicentennial with boat load of "tea kegs" labeled with various Federal alphabet agencies, dumping the tethered boxes overboard. I was there when Howard Jarvis stood against the tax/spend/elect madness in '78. I spoke before what the Daily News said was a half million people at the Taxed Enough Already Rally in Trenton, NJ. I stood with Ron Paul when the National Committee to Relegalize Gold won back our right to own gold bullion in the mid-70s, breaking nearly a half century of continual erosion of our property rights. And of course, I've stood with the TEA Party from its inception during '06/07. I rejoined the Republicans in '08 at Ron Paul's behest and changed my affiliation back to LP before the last nearly meaningless election. For the past decades I've been a health and food freedom and justice advocate, now working as Trustee and Counsel with the world's leading health and food freedom NGO, the Natural Solutions Foundation. Why do I tell you this? Not for self-aggrandizement. I've almost always been on the "losing" side in public affairs! My story is typical of those people who form the core of the TEA Party. We have never been comfortable working with the (G)OP and, like Ron Paul, have been in and out of that party. No more cooperation with the (G)OP! When the (G)OP changed its rules after the Primaries to marginalize the TEA Party, by not even allowing Ron Paul's name to be put in nomination, it sealed its fate. Hundreds of thousands of "new blood" activists left that party. Three million less people voted for that party in '12 as in '08. The (G)OP lost a presidential race it should have easily won because it rejected the TEA Party activists and has new rules to make sure "we" never wrest control of that tax-eater party from its tax-eating establishment. The Conservative and the Libertarian Parties have different strengths in different parts of the country. It should be possible to bring these parties together with joint candidates in some areas, leading to a joint presidential race in the future. Ron Paul showed us the way. In 2008 he brought together what he called the Principled Parties (of "right" and "left") at a press conference at the National Press Club, where the four parties issues an historic Joint Policy Statement. The Media of Mass Deception suppressed knowledge of this extraordinary example of Dr. Paul's leadership. But had those four policy points agreed to by the four parties been public policy, there would have been no Crash of '08. 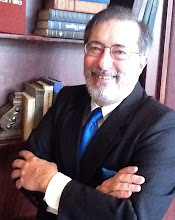 I urge the leadership of the TEA Party groups to act as "good faith brokers" with the leadership of the Conservative Party, the Libertarian Party and similar parties that support the Constitutional Republic, to begin the process of creating something new in American politics: an electoral alliance to challenge the two tax-eater parties; to finally bury the rotting corpse of the (G)OP. That alliance should work closely with Ron Paul's Campaign for Liberty. The time to act is NOW! The time will come, in an election cycle or two, when it will be impossible to deny that the Federal Establishment is bankrupt and has squandered the credit of all Americans. When Americans can no longer pretend that the two tax-eater parties are anything but the criminal gangs they have become, we will either turn toward a Liberty Electoral Alliance, or we will have lost the Constitutional Republic, irrevocably. * - It is incorrect economic thought to believe that NOT raising the Federal Debt is the same as "defaulting" on the debt, as the tax-eaters would have us believe. If the United States has to borrow more money just to pay the interest on the existing Federal Debt (and not "default") then it is technically "bankrupt" -- but since the Federal Tax-Take greatly exceeds the interest on the Federal Debt, there is no possibility of "default" unless the tax-eaters want to default to pressure the productive into giving up more, ever more, to the greedy crony corporatist political class. IMHO, the only ethically correct position on the Federal Debt is what Lysandor Spooner urged well over a century ago: REPUDIATION. Those who knowingly "loan" a spendthrift bankrupt ever more fiat dollars do not deserve ever being repaid, and certainly not repaid in Constitutional gold and silver coin! Voters Support Ending Two Tax-Eater Party Duopoly! 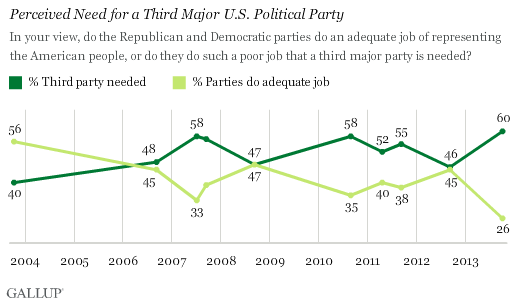 "PRINCETON, NJ -- Amid the [sic] government shutdown, 60% of Americans say the Democratic and Republicans parties do such a poor job of representing the American people that a third major party is needed. That is the highest Gallup has measured in the 10-year history of this question. 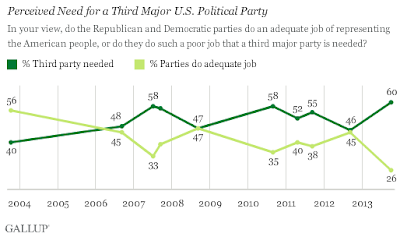 A new low of 26% believe the two major parties adequately represent Americans." 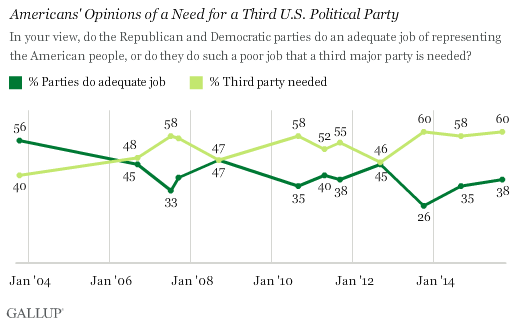 Note that since the "shift" in late 2006 (the coming of the TEA Party?) 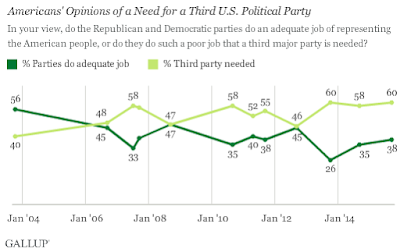 the larger part of those polled have continuously been ready to jump away from the two tax-eater parties.